Build five of the world's most iconic structures with this book of architectural models, following step-by-step instructions to assemble the tab-and-slot pieces, photographically printed on die-cut glossy cardstock. Here are the Colosseum, the massive stadium of ancient Rome (built 72-80 AD); the Eiffel Tower, symbol of Paris and wonder of the industrial age (1884-89); the Sydney Opera House, an engineering marvel that took 17 years to design and build (1956-73); Toronto's CN Tower, the tallest structure in the Western Hemisphere (1968-76); and New York's One World Trade Center, the 104-story tower that defiantly commemorates the ones lost in the 9/11 attack. 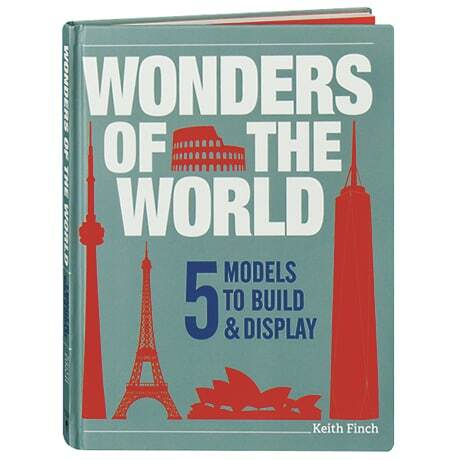 The models vary in size—One World Trade Center, for example, stands over 24 inches tall—and each is introduced with a mini-history and captioned photos.